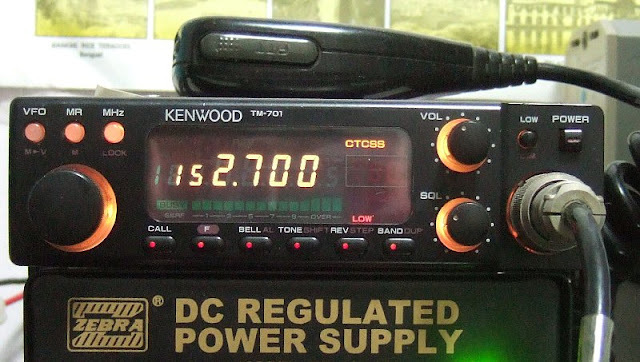 Kenwood TM-701A is a dual band 2 meter, 440 MHz transceiver that combines two radios into one! It is very compact and features 20 memory channels and multi-scan functions. Extended receive range is 136-174 MHz and 438-450 MHz. Power output is 25/5 watts on 2 meters and 35/10/5 watts on 440 MHz. Frequency step is selectable at: 5, 10, 15, 20, 12.5 and 25 kHz. CTCSS tone encode is built-in. Only 5.51 x 1.57 x 7.87 inches 3.1 Lbs. (140x40x200mm 1.4 kg). Requires 13.8 VDC at 6.9 amps. MC-44DM multifunction DTMF hand mic included.